It's bad enough that the NOG (New Ownership Group) foists roof-top-garden-grown kale on Fenway food, now they've really gone all "foo-foo". 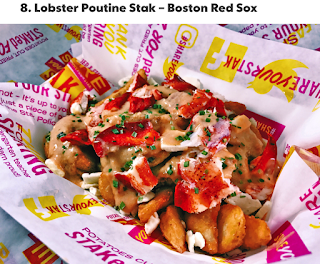 Announcing their latest dumb menu item: Lobster Poutine Stak. Huh? Apparently, it includes "fries covered with fresh lobster meat, cheese curds, bisque and chives." Any guess what this beauty will set you back? Probably about as a much as a Grandstand seat. Whatever happened to a $4 Fenway Frank and a $2 Coke? USAToday ranked this monstrosity as the eighth best new ballpark food item. Really? Must we be subjected to this Brookline cocktail party crap while we try to watch baseball? These guys are so out-of-touch with average fans it's pathetic. Sure, they gave us three rings, but they have never been from here and they never will be. As hard as they might try, they're just not Boston.